Known affectionately as the Man in Black, Johnny Cash is a figure who has towered over popular music, casting a long shadow over the history of both country and rock and roll. He was born and raised in Arkansas, and was writing songs from the age of twelve, inspired by the artists that he heard on country radio. Unlike many of the legends of his time, he did not pick up a guitar until much later, purchasing one while he was in the Air Force. After his time in the service, Cash married and settled down in Memphis, Tennessee, working odd jobs while focusing on his music at night. Memphis was at the crossroads of music history in the fifties, and after his country music trio scored some local radio time, Cash landed his first audition for Sun Records president Sam Phillips. He sang gospel the first time out, and was turned down, but when he returned with the more mainstream “Hey Porter”, he landed a deal with the label. His first singles were billed as Johnny Cash and the Tennessee Two. When “Cry, Cry, Cry” hit the top twenty nationwide, Cash earned a slot on the Louisiana Hayride. By 1957, Cash was a regular on both the country and rock charts, much like his contemporary and one time labelmate, Elvis Presley. Cash moved from Sun to Columbia, where he would spend the next three decades as one of their top acts. 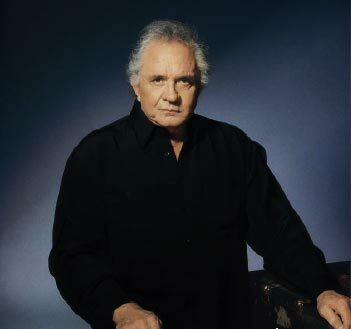 Cash consistently scored hits throughout the sixties, and released several concept albums that revealed his knowledge of American history and love for historical music. Despite having some big hits during this time, like “Ring of Fire” and “Understand Your Man”, Cash’s struggles with drug addiction were making it difficult for him to maintain a consistent level of success. A new marriage to June Carter and a conversion to Christianity helped turn things around, and by the end of the sixties his star had reached new heights. Two live albums recorded in prisons and a popular network television show made Cash a bigger star than he had ever been before, with “A Boy Named Sue” and “Sunday Morning Coming Down” crossing over to the pop charts. But the hits became more sporadic in the seventies, and when he was inducted into the Country Music Hall of Fame in 1980, it looked like his best days were behind him. He was unceremoniously dropped from Columbia in the mid-eighties, and put out a handful of poorly received albums with Mercury. He would later describe this period of his career as when he was “burlesquing Johnny Cash” instead of being Johnny Cash. But Cash returned with a new energy and vision when he partnered with producer Rick Rubin, releasing the critically acclaimed, Grammy-winning American Recordings in 1994. The mostly acoustic album was the first in a series with Rubin that would introduce Cash to a new generation of fans. Three more volumes were released during his lifetime. The final one before his death, American IV, included a cover of the Nine Inch Nails classic “Hurt.” A haunting video was filmed to accompany it, and was one of the final things Cash created with his wife, June, in early 2003. June passed away only weeks later, and Cash followed her in death that September. In the years since his passing, a Hollywood film about Johnny and June called Walk the Line further immortalized Cash’s legacy, and his catalog sales in recent years have been extraordinary, ensuring his music and legend will live on for the foreseeable future. Man in Black has to be included on the essential singles list IMO. Interesting. I thought Cash was a shoe-in for the top spot. Having a blast reading the write-ups – awesome job. I am a big Johnny Cash fan and Johnny Cash at Folsom Prison was one of the first albums I purchased way back in 1968. Unlike many, I really liked Johnny’s Mercury albums, probably more than his later Rick Rubin albums. I think Cash was down on them later because they didn’t receive much critical acclaim BUT they were the first Cash albums in years where it sounded like he was having fun while recording them. First, thanks for the positive feedback. This list took a long time to get done, mostly because once you get to the top thirty or so, it feels like everybody should be in the top ten. The history is so rich. Regarding Cash, I have affection as well for the Mercury albums. I think he tried a little too hard to recreate the sound of his fifties work, but couldn’t quite tap into the spirit. They feel like affectionate looks backward. I think some of his work with Rubin is overrated – I don’t care much for Unchained or American IV – but I think the first one sounds as brilliant now as it did in 1994, and that III had the best collection of songs, and his last set of effective vocal performances. I also totally hated what Walk the Line did for the popular image of Cash, which is so distorted. Though at least Joaquin Phoenix bore a resemblance to at least some essence of Johnny Cash. Reese Witherspoon’s June was a travesty, IMO. Probably more on the writer/director than the actress, but there wasn’t an ounce of June in there at all. Like all of the giants listed here, Johnny’s popularity goes well beyond the confines of the country music world. One of the reasons for this is because he wasn’t afraid to champion artists that would otherwise have largely been shunned or scorned by Nashville–people like Bob Dylan, whom he had as the very first guest on his TV show in 1969. The other thing is that, unlike a lot of other artists in Nashville (and indeed most of Nashville in general) in the 1960s, he was very open-minded. This garnered him the kind of respect and crossover appeal that separated him from almost everyone else who came before and even has come along since. Can you elaborate on how you think ‘Walk the Line’ distorted the popular image of Johnny Cash? I am not contesting the point, just curious. I personally enjoyed the movie at the time it was released. However, it has been several years since I last saw it and I’ve learned a lot about the real Johnny Cash in the meantime. I might need to watch it again and re-evaluate my opinion. Interesting Kevin. I too thought that June was not portayed properly in “Walk The Line”. I have to admit I never listened much to her but what little interviews and performances I had seen didnt seem to match at all in the movie. I still do enjoy the movie though. …another ambitious project of kevin has come to an end. excellent job full of hard work – kudos. from a outside USA perspektive, johnny cash would have made the top spot hands down. his already legendary american recordings have made him an icon this side of the atlantic ocean, that even people, who would belittle the genre in general, would proudly threw into any discussion about great music and artists. none of the others around him in this list would be considered as important as cash. undeservedly so, however. the older i get, the more i agree with kevin on the placing of george jones. all in all, his singing and his catalogue are something else, which is amazing, since it still holds that place for me relative to merle haggards music, which is a benchmark hard to reach, not to mention to beat. in sum, this list makes it pretty clear – there has been some extradordinary quality out there in country music and from whatever angle you approach it, it should be possible to find someone that you might think: he/she’s the – famous or infamous – real deal! kevin’s countdowns are great vehicles into the adventure of discovering country music. thanks for undertaking a highly appreciated task, mr. coyne.